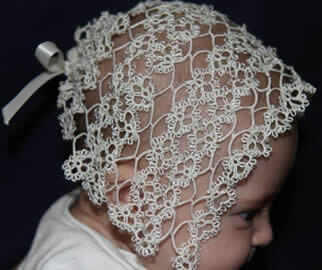 There is neither documentation, nor any examples of tatted lace prior to 1800. 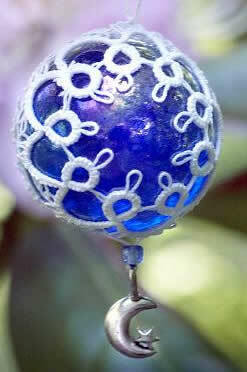 All of the available evidence shows that tatting originated in the early 19th century. Our featured lady, Elaine O’Donal says that tatting was done in the 18th century and possibly even in the 17th century. The documentation is vague due to the lack of study and patterns. 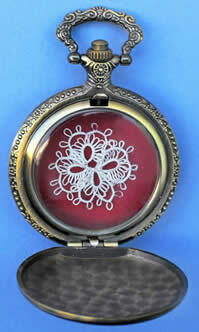 Patterns for tatting were passed along by word of mouth, and often never written down. We know Martha Washington was a tatter, and there is even a pamphlet with some of her tatting and crochet patterns. 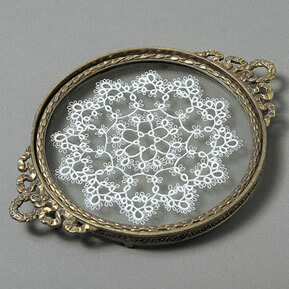 In Victorian times, when fashion included feminine touches such as lace collars and cuffs, this creative art flourished. As fashions moved to a more modern look and technology made lace an easy and inexpensive commodity to purchase, hand-made lace began to decline. Elaine started her business “Tatted Webs” 28 years ago. She reports, “After tatting for a number of years and giving away most of it, people started commenting that they had enough tatting and maybe I should try something else. I decided to stick with it, and as my daughters grew, so did my business.” Elaine participates in many arts & crafts shows in the northeast and East coast; some years doing as many as 20 shows and a few shops in between. Now she has cut back to about 12 shows a year, more for quality than quantity. She also teaches tatting and demonstrates the craft. Her husband was the one who came up with the name "Tatted Webs" as he was fond of likening her to a spider. One day her daughter was with her in a bead store and saw a spider charm and said, "Mom! Look this is perfect for you" At that time Elaine didn't know what she would do with it, but the name stuck and so did the charm. Elaine says that her spider ornament has been one of her best selling items year after year. “That is saying a lot considering I do hundreds of ornaments” she reports. She changes up the designs from year to year, just so she doesn’t get bored with them. She has customers who have been collecting Elaine’s tatted Christmas ornaments for many years. “Their Christmas trees must be covered by now, but they are small and light and like real snow flakes so there is always room for more.” Elaine says. When asked about the time involved in her craft, Elaine told us, “It is hard to say just how much time it takes to make any one piece. Many pieces cannot be made in just one sitting, and at any given time I have more than one piece in the works, it is very repetitive and requires breaks from time to time to rest the hands and wrist and eyes. For example, the mitts, or fingerless gloves, are my original pattern. However, there really isn't a pattern at all, it depends on a lot of judging by eye and measuring. Originally from New Hampshire, Elaine now lives and works in Gorham, Maine with her husband in an old 1850 farmhouse. She likes to decorate in a Victorian style with as many antiques as she can find. They have two daughters - now grown and living out of state and an adorable grand daughter (aren't they all?). Her grand daughter has become Elaine’s latest inspiration, which you can see on her web site as "Wee Webs". In her spare time, she tries to stay in shape by cross country skiing in the winter, cycling in the summer, and fencing – which she does year round. please email or call us and let us know!